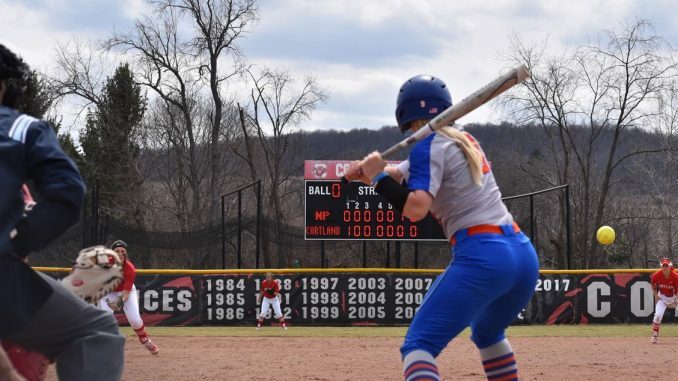 The softball team (16-7, 5-3 SUNYAC) is off to a great start in State University of New York Athletic Conference (SUNYAC) play after a series sweep over The College at Brockport and two splits against Oswego State and SUNY Cortland. On Friday, March 29, New Paltz battled SUNY Geneseo to a series split, with first-year pitcher Katie Quagliana pitching a no-hitter in the first game of the double-header. The team managed to score two runs against Geneseo during game one, but fell behind in the second for a 0-4 loss. Last Saturday, the Hawks went up against The College at Brockport and came out ready to play. Brockport’s Golden Eagles scored the first two runs with a double and a single in the first inning, respectively. A walk with the bases loaded put the Hawks on the board and a passed ball put them within one allowing New Paltz to tie the game in the seventh inning on an RBI double from third-year third baseman Meagan Blair had New Paltz tied with Brockport, leading to extra innings in game one. In extras, Quagliana pitched her heart out and forced a 1-2-3 inning, setting the stage for the Hawk’s walk-off. Fourth-year shortstop Taylor LaFrance knocked a single straight to the pitcher, but managed to get on base. Quagliana quickly followed with a ball to left field, giving LaFrance the go-ahead to round third and slide into home plate for the game-winning run. Heading into game two, the Hawks made sure to keep their momentum going. LaFrance hit a single to end up on base, and two hits by second-year third baseman Ashley Puig and second-year outfielder Celia Santini, respectively brought LaFrance home to score the first run. Another single to right field by Blair sent Puig across home plate, and two subsequent runs were scored after third-year first baseman Kelsey Trudden drove a single to left field to make it 4-0. In the top of the seventh, the Golden Eagles hoped to increase their score with a single to left down 7-2. They managed two runs in the inning, but came up short of the Hawks 7-4 after a pop-up for the final out. The Hawks were at it again the next weekend, traveling first to Oswego and then Cortland where they split both double-headers. New Paltz first battled it out against Oswego, losing the first game in a 0-8 shutout. “I feel that I could’ve adjusted better at the plate against the first pitcher. And with regards to that, creating more solid contact that would get me on base for the team and put us in scoring position,” Puig said. The second game gave the Hawks a chance to redeem themselves, and a single to the left side by LaFrance started a rally in the first inning. Puig followed with a single to center, and an error allowed LaFrance to score the first run. Trudden picked things up in the second inning with a double drive to left field, and a subsequent single by Quagliana sent Trudden back home for the second run of the night. Oswego did not score any runs in the second game, giving New Paltz the 2-0 win. The Hawks were back at it again on Sunday, April 7, facing off against SUNY Cortland for another conference double-header that went into extra innings. In extra innings, Bowen hit a single and launched Puig home, giving New Paltz the advantage 2-1. Second-year shortstop Katie Conrad and fourth-year second baseman Shannon Fee scored the final two runs on a groundout and double from second-year outfielder and utility Nina Simms, putting the Hawks ahead 4-1 to win game one. Cortland beat New Paltz in the second game of the day 0-2, scoring their sole two runs in the third inning. New Paltz will continue conference play on April 13, with a double-header at SUNY Oneonta starting at noon.